Fast deployment fence booms are the right choice to contain oil spills if you are limited by space or manpower. It deploys much faster than any other boom due to its design.– 1,000 ft (300m) can be deployed from a reel in 8-10 minutes. It complies with OPA-90, US Coast Guard – OSRO and ASTM F1523 boom guidelines. It works great for emergency response in Marinas and Ports. Available in a great range of fabrics and sizes. 16” Calm Water Fast Deployment FENCE Oil Boom – for calm water applications. No top cable. 17” Marina Fast Deployment FENCE Oil Boom – for Marina applications. W/ Top tension cable. 19” Responders Fast Deployment FENCE Oil Boom – Used by oil spill responders. W/ Top tension cable. 25” Port Fast Deployment FENCE Oil Boom – for ports & bays. W/ Top tension cable. 30” Coastline Fast Deployment FENCE Oil Boom – for coastlines. W/ Top tension cable. 36” Offshore Fast Deployment FENCE Oil Boom – for offshore applications. W/ Top tension cable. 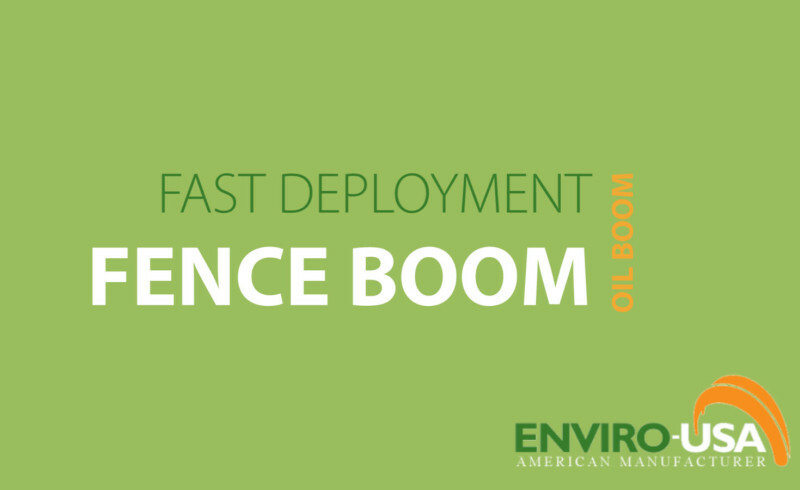 For more details and a free quote, please visit Enviro-USA’s Fast Deployment Fence Boom web page or call 321-222-9551.